As far as Dan knows, no one has traveled the entire distance on foot. He's made several attempts at this; the latest one was shut down by wet weather and avalanche risk. 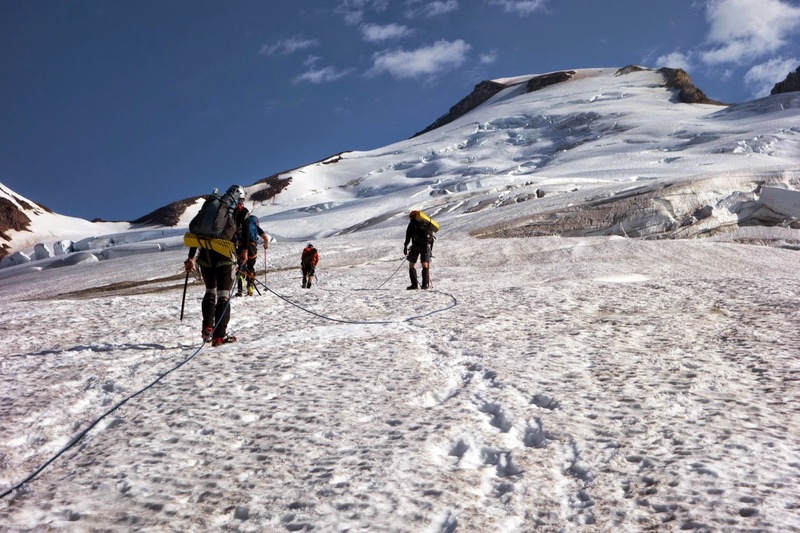 Eight people started the run six weeks ago and stopped when the summit was deemed unobtainable. 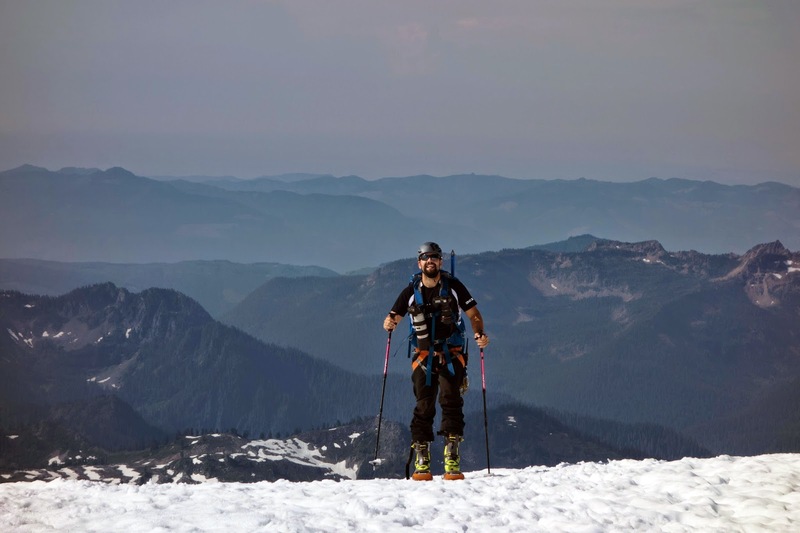 Dan, Beat, and a young Bellingham runner named Aaron still ran all the way back to Bellingham, completing a 100-mile distance despite the failed summit attempt. Dan still wanted to make the whole thing happen, so he watched the weather all of the following weekends until a window opened on Aug. 1. 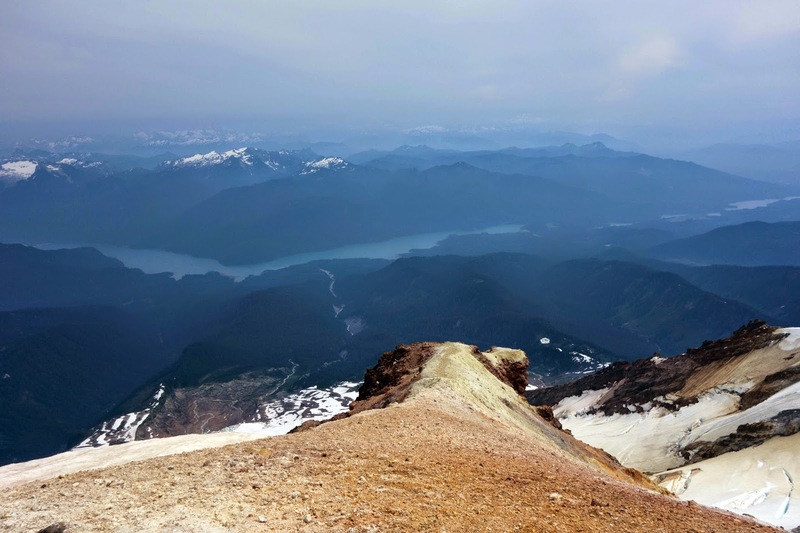 Aaron, who wanted to see the summit, would return for another hundred-mile run — his second overall. Beat still wanted to be a part of the fun, so he made last-minute travel reservations for Bellingham. This time, I was able to join for crewing and tagalong fun. Daniel is pretty good at promotional stuff and enticed quite a few sponsors for the adventure run. Humorously, some of his main sponsors were a brewing company, a donut shop, and a small-town diner. He loaded up our crewing rental car with six packs of beer, donuts, and ice cream packed on dry ice. "Don't you want some water or electrolyte stuff?" I asked. He just shrugged and assured me another friend would bring them Gatorade later. 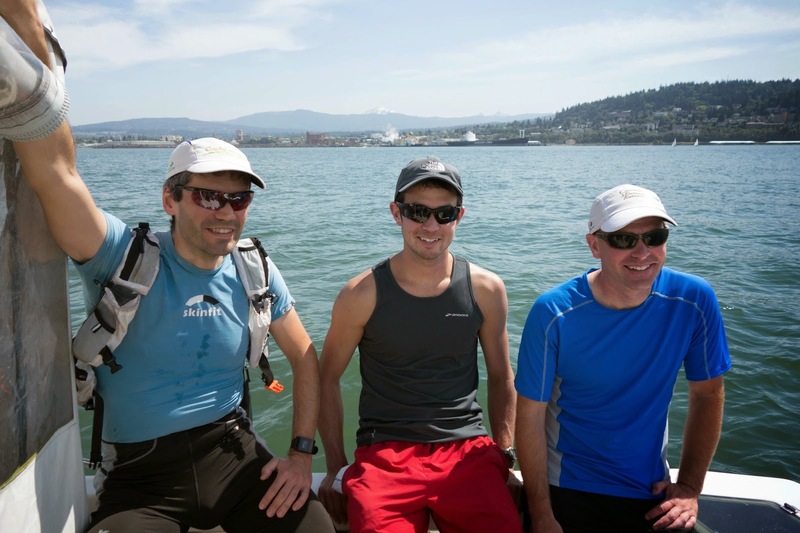 Dan also recruited a friend with a boat to take them out on the bay so they could catch a glimpse of the peak before starting their 45-mile approach. There was no landing on the starting line beach, so they jumped off the vessel for a below-sea-level start at about 12:30 p.m.
One of Dan's friends, Cam, joined me for crewing in the first 25 miles. Cam is an Army veteran who is now on disability following a Humvee explosion in Iraq, and she had lots of interesting stories to share. Her disabled status is actually thwarting her career dream of becoming a federal agent, so she moved back to her hometown of Bellingham and works as a full-time volunteer for several running groups and other organizations. I handed over the keys to the crew car and joined the boys for the traverse from Lake Whatcom to the town of Acme over Mount Stewart. It was 12 miles through some beautiful forest and over a powerline cut, and the temperature was sweltering. The weather window opened in a big way, and this usually cool and rainy region was experiencing temperatures in the high 80s and low 90s, with high humidity to add to the suffering. By mile three I was so drenched in sweat and mildly feverish that even light breezes felt chilly. Descending into Acme, we could see the objective still in the far distance. The boys took a long break at the diner and Beat enjoyed a milkshake and breakfast sandwich at 7 p.m. 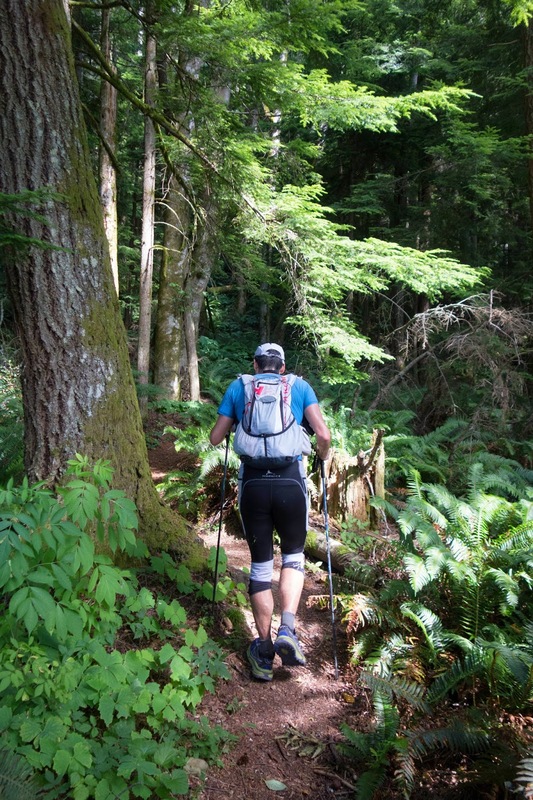 It would be another long 23 miles to the base of the mountain on the historic approach from the Middle Fork of the Nooksack River. I arrived at the trailhead around 9 and found two friends of Daniel's who planned to assist us with the climb. During their June attempt, Dan had recruited a few experienced friends to guide, but no one was available to guide this attempt. 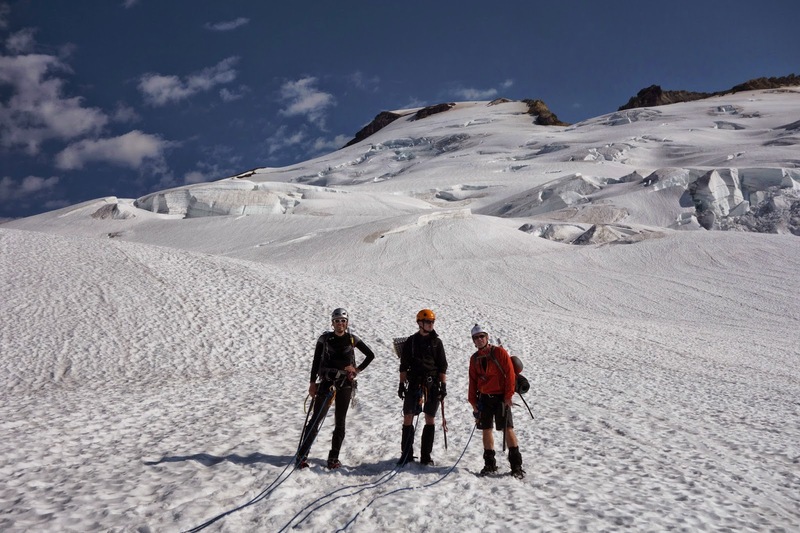 Of the four of us, three have never traveled in a rope team and Dan had only been up Mount Baker once before, with a guide. 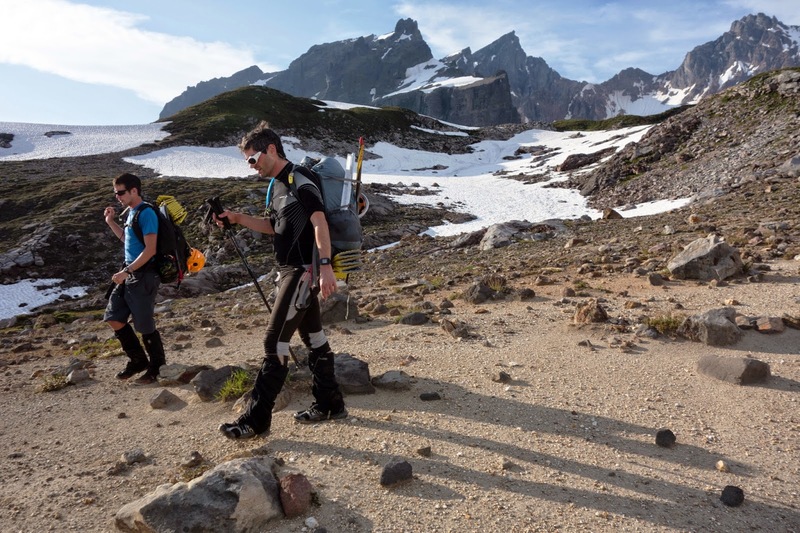 Dan's friends, Max and Chris, planned to ski the glacier but would remain close by in case there was a mishap. At the trailhead, I found them scouting out the river, which we'd have to cross. After several hot days the water level was high and the hydraulics were sobering. "There's no way we can cross that," I whispered, and Max and Chris assured me we'd figure "something" out. I remained awake for the next four hours, fretting about this river crossing. I know stressing does no good, but I have a difficult time controlling anxiety when it comes to my fears, and whitewater is the deepest of my fears. There I was, preparing to attempt my first-ever technical glacier climb, and I could not get the image of rushing water out of my mind. I had just dozed off when Beat, Aaron, and Dan arrived around 2:30 a.m. and started loading up for the climb. 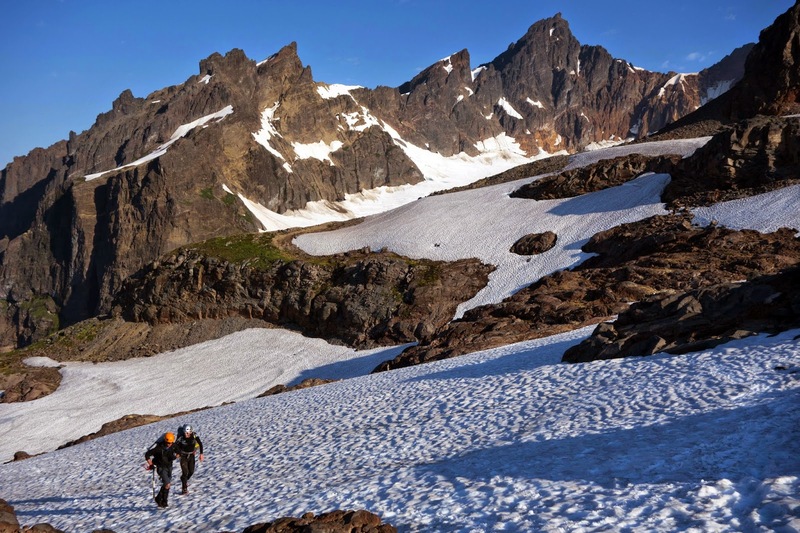 We were all carrying an enormous amount of gear — axes, crevasse rescue stakes, carabiners, helmets, harnesses, crampons, emergency sleeping bags and pads, trekking poles, water and food, personal supplies, and cold-weather clothing. Dan had a rope and Chris and Max carried ski gear, but I'd guess my pack weighed at least 35 pounds. I also broke out my old pair of Montrail leather hiking boots that I don't think I've worn in at least six years. I focused on Zen breathing as Dan led us through a bushwhack along the shoreline of the river to a log that he and others had thrown over a narrow section of the river several weeks earlier. The river was high and he wasn't sure it was still in place. It was, but it was only about a foot wide and tapered at the end, crossing about thirty feet over an especially turbulent channel, because it was so narrow. Beat and Aaron scooted over on their butts, but when it was my turn to do this, the whole world started spinning and I felt precariously close to blacking out. Panic was bubbling up and Zen breathing was not working. "I can't do it, it's too scary, I'm sorry," I called out. 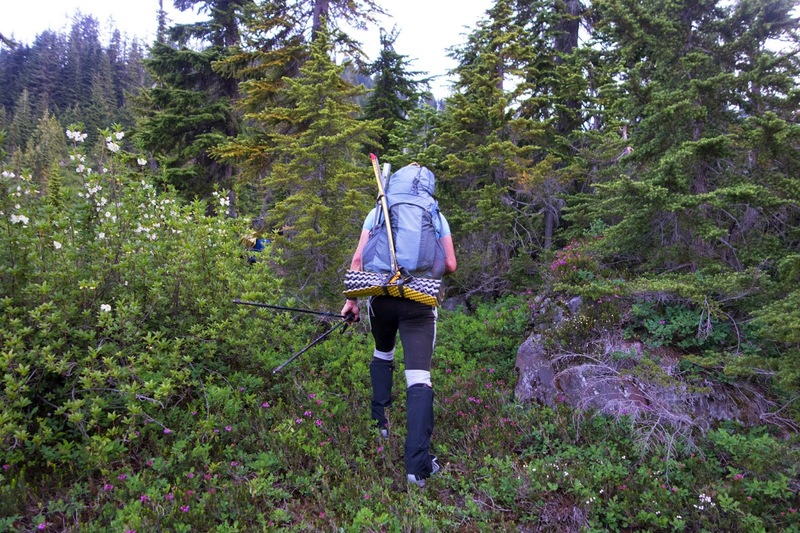 I believed this was the end of my Mount Baker attempt, but Daniel offered to shuttle my pack across to see if I'd feel more comfortable going over unloaded. I wasn't, actually, but logically I knew I'd be more stable, so I threw my legs over the thin trunk, pressed my feet against the wet, bald surface, and started scooting. The irrational and extremely unhelpful panic started to boil over and I needed to focus on anything else so I started mouthing the words to "Peaches" by the Presidents of the United States of America. Where that inclination came from, I have no clue, and I can't say it worked exactly ... but I did make it to the other side without falling over in a dizzy fog and slamming against rocks on my way to a painful death downstream. Daniel shuttled my pack across by walking foot-over-foot across the log. I was impressed. From the river crossing we followed the mostly unused and highly overgrown Ridley Creek Trail, a strenuous haul through thick brush, deep trenches, and over, under, or around endless deadfall tree trunks, sometimes five feet thick. Sometimes packs had to come off to get around the monster timber, and headlamp beams reflected an ongoing curtain of spider webs complete with monster spiders. Flies and moths swirled through the air and lodged themselves in our noses and throats. After two and a half miles of fading trail we veered up a ridge for a proper bushwhack. As we hacked our way up the brushy slope, we'd pick up remnants of a track that Daniel said was part of the original pack route used by the racers in 1911. 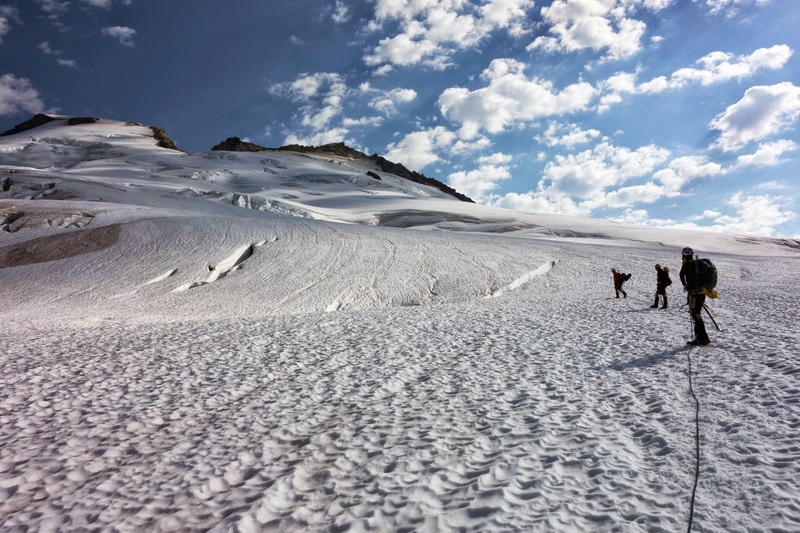 The reasoning behind this approach was that it's the closest access point from Bellingham Bay — but it's also one of the most difficult and least used glacier approaches on the mountain. By sunrise, about 6:30, we had covered a mere four miles with less than 3,000 feet of climbing. 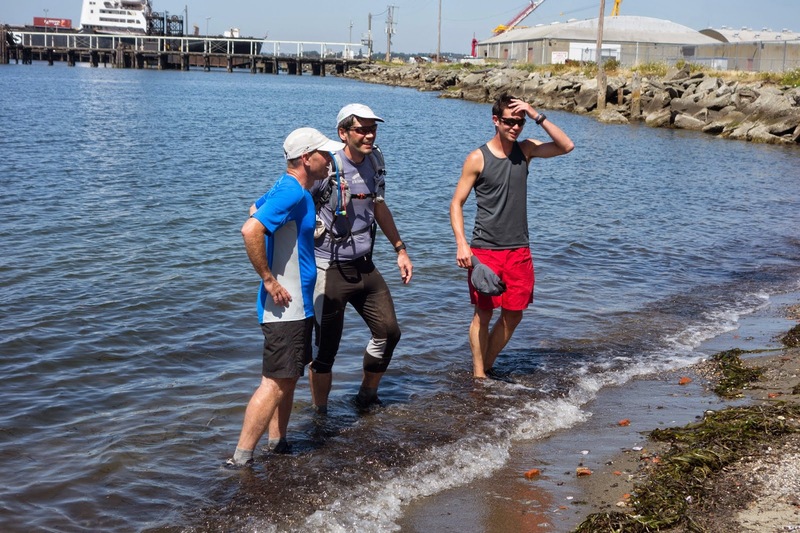 On paper, especially as part of a 108-mile run, the distance was minuscule — but the effort was huge. 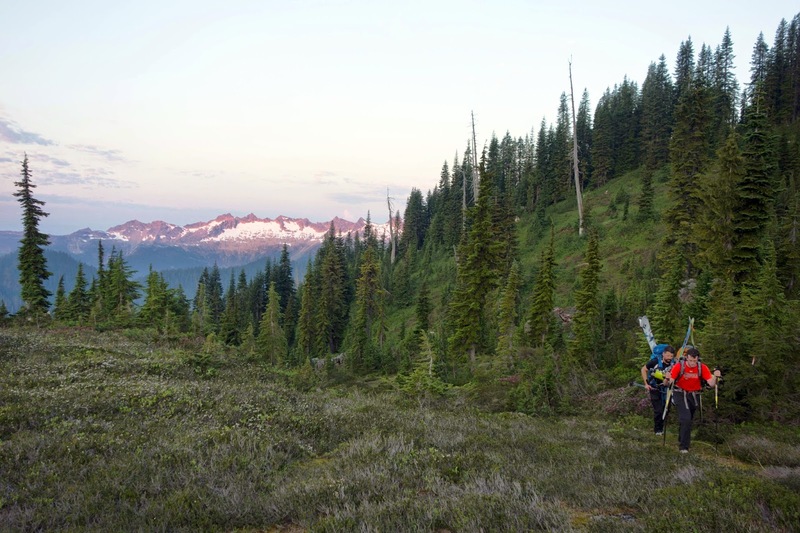 There's really nothing that quite compares to bushwhacking with heavy packs (or bikes) in tow. I was exhausted and having flashbacks of the Stettynskloof, and we still had an entire mountain to climb. Happily, some friends of Daniel's had hacked their way up Ridley Creek the night before, and woke up in the middle of the night to cook bacon for the boys. From their gorgeous camp by Mazama Lake, they served the bacon, fresh bread, and apricots for breakfast. It was a nice boost despite being devoured by mosquitoes while we lingered. Even after being awake for the past twenty-four hours with long travel and very little sleep the night before that, Beat was stoked. You can see why. The morning was perfect although already very warm at 8 a.m., and reflective heat was radiating from the snow fields as we climbed toward the glacier. Lesser known fact — under direct sun on a warm day, snow will actually increase the "feels like" temperature, because of all the sunlight reflecting off the white surface. So temperatures in the high 70s will feel like 100 on a glacier. 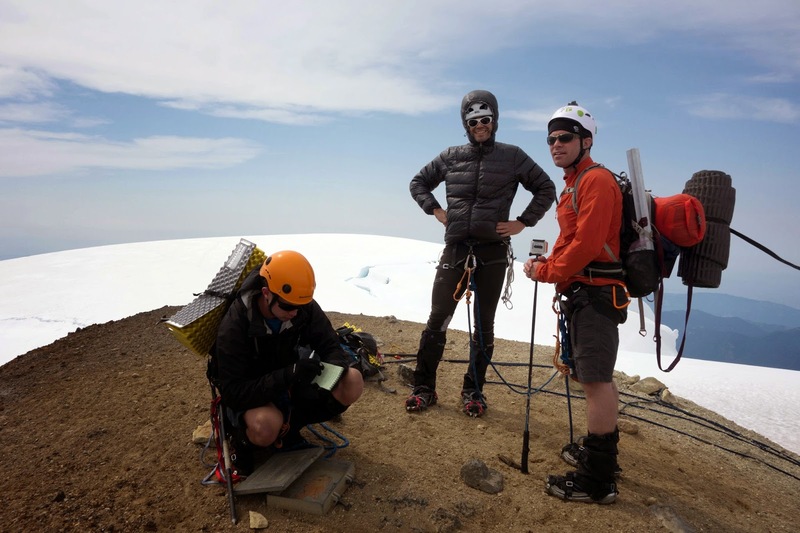 At portal camp, we roped up to scale a steep headwall and climbed onto the glacier around 6,000 feet elevation. 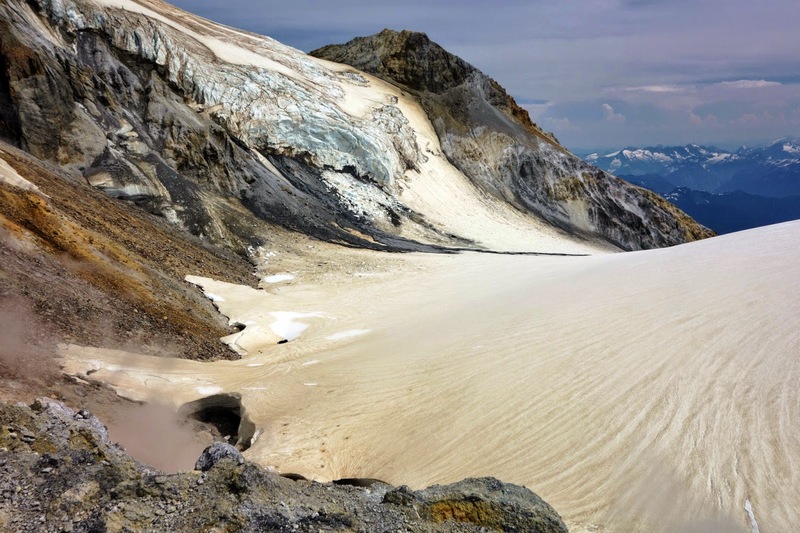 This was our first view of the massive seracs of Mount Baker. It's impossible to depict the scale, but this wall was well over a hundred feet high. 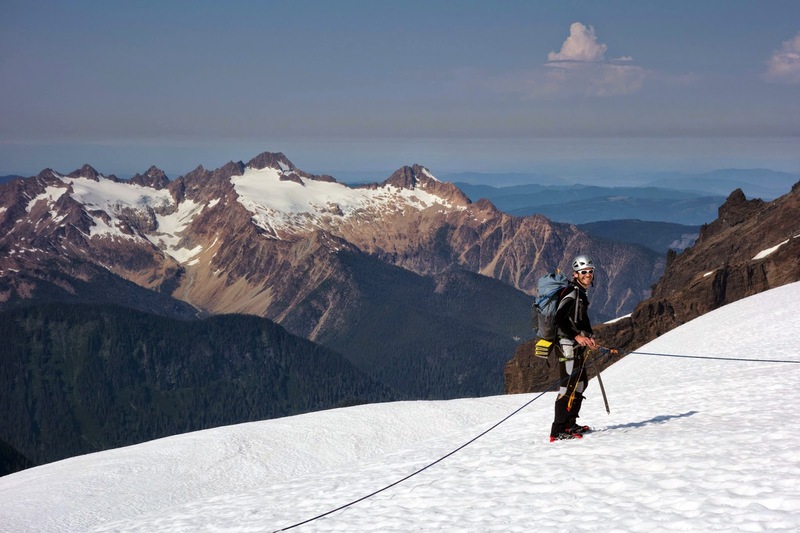 The roped travel was important because there are crevasses everywhere, and a few steeper pitches at 40 degrees or more where falls are difficult to arrest. Daniel was the only one of the four of us who had traveled in a rope team before, so he led. I was a little nervous about climbing without a guide and my own very limited experience with glaciers (mostly seeing them from above while ridge-walking in Juneau, and watching movies.) But it was a good day for a glacier climb, with high visibility and soft, forgiving snow. As the day heated up, the snow conditions progressively deteriorated from "forgivingly soft" to "molten lava." We were postholing up to our shins and slipping a few centimeters backward with every step, which made the already steep climb even slower and more strenuous. The skiers stayed close at first and Chris even took a few shots with a helicopter drone that Max carried up in his pack. However, as the elevation increased, Max struggled with the altitude and they slowed substantially. We pressed on ahead, following the main boot track until we came to a split. The freshest track veered left between two scary huge seracs, and the older track went up a nice, low-angle slope with no crevasses in sight. 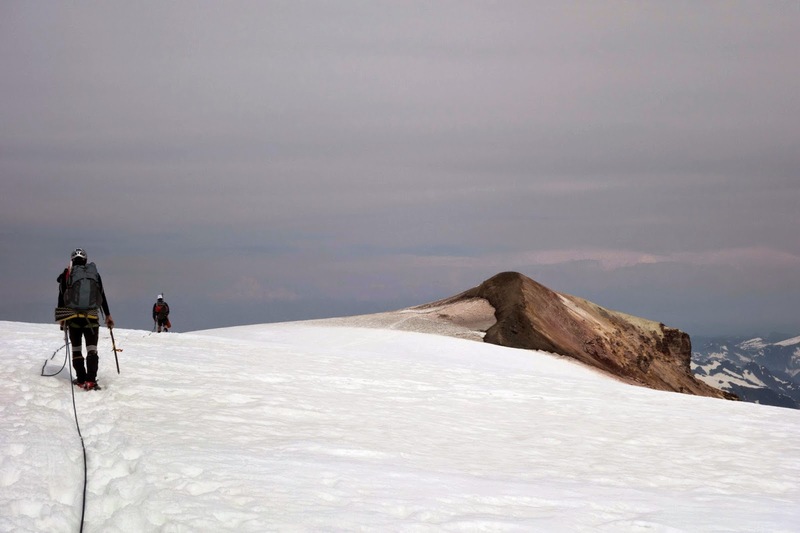 I advocated for the track on the right even though it soon became clear that no one had been up that way on that day, and we had climbed another 400 feet by the time we realized why — a snow bridge collapsed and opened up a crevasse across the track. It was only about two feet wide, but we couldn't see the bottom. Jumpable, but scary. We belayed as best we could and went across one by one. Beat remained giddy the whole time. I have a feeling he's soon going to acquire a new hobby with all of this cool new mountaineering gear. 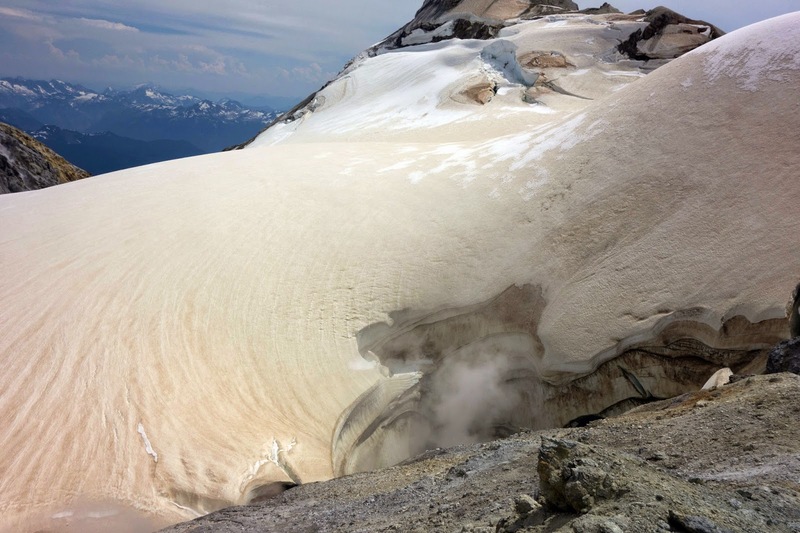 When we reached the caldera, we stopped on the rim to gaze at the steam pouring from the volcano. At 9,760 feet elevation away from the sun-reflective snow, it was actually a bit chilly, especially with a stiff breeze cranking along the rim. Daniel chose this place to wait for Chris and Max, and promptly fell asleep curled on his mat. I sat on my pack until my frostbite-damaged toes began to hurt badly. I was anxious to get moving again but couldn't do much about it because I was still roped to three snoozing ultrarunners. Finally, after about forty minutes and on the brink of shivering, we radioed Chris who informed us that they were still coming up, and still probably another half hour or more back. We opted to push on to the summit over the crux of the climb, the "Roman Wall." I found here that being on the back of a rope team is not so fun, because by the time the other three reach the flatter traverses, I was still making my way up a 40-degree pitch. Their pace increased and I had to match it on the toughest terrain, and then match their slower speeds while I made my way across flat traverses and they climbed the walls. Still, I didn't have 45 extra miles on my legs, so I couldn't exactly complain about the pace. Crossing the summit ridge with high clouds above and haze below. It was breezy and coolish, but any wind-protected spot still felt like an oven. Views from 10,800 feet. We could look down and see the Nooksack River branch where we started 9,000 feet lower. Summit obtained at 2:25 p.m. It had taken eleven hours to cover nine miles of a 108-mile run. 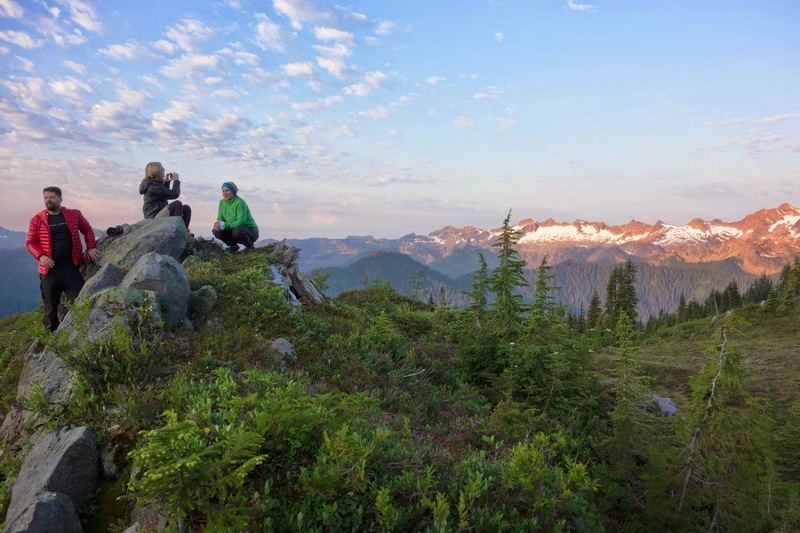 The trail register was signed "Second ever summit from Bellingham Bay on foot. Now for the return." Dan had been the first during an attempt one year ago, but altitude sickness forced him to abandon the return effort. This is what they were going for this time — the full summit plus return trip. 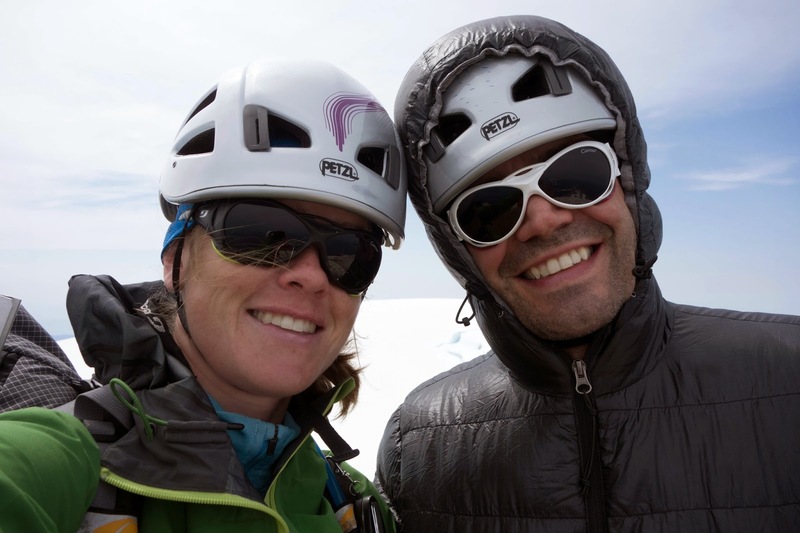 Aw, don't we look cute in climbing gear? Beat and I both lack some of the important temperaments of a climber — patience, no debilitating fears of heights, and (in my case) even average balance and coordination. But we both love the result of climbing mountains, so we'll likely work on increasing our skill set for future (mildly technical) ascents. 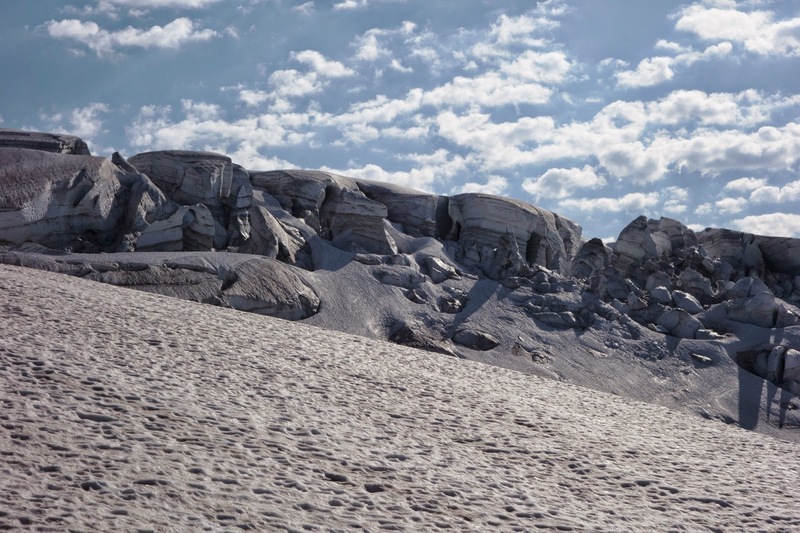 It was still a long way down, with a super-heated glacier descent, a steep downhill hack, and the hardest miles on the Ridley Creek not-quite-a-trail right at the end. Once we were past the glacier and the summit buzz wore off, I spent the rest of the descent fretting about that river crossing, again. I resolved to Zen through it, I'd sing "Peaches" if I had to, it's not so bad, it's really not so bad. But no amount of logic seems to work on my inner panic button. As soon as we could hear the roar of the rapids, my heart started racing. I practiced Zen breathing until we reached the log, and then the hyperventilating began. I was very angry with myself. "Why do you have to go and be like this?" I didn't have a choice about crossing the river this time around, but now I was fatigued after no sleep and an 18-hour hard effort, and my hands were shaking. Argh! Daniel was pretty shattered himself but offered to carry my pack again. I fear that he may have thought he didn't have a choice because I was crying. I actually was. I realize the silliness of being so afraid — although a fall into the river likely would have been disastrous, the log crossing was not hard. The river was flowing even higher at the end of the hot day, and spray splashed against my feet and pants as I scooted across. Nothing else was stifling the panic so I focused on Beat's face and simply counted in fast breaths — one, two, three, four ... until I lost count, and started over. I wish I could do something about this fear of water, which has been a major part of my psyche ever since I was temporarily caught by a rope and trapped beneath an overturned raft on the Colorado River in 2001. I suspect I may need hypnotherapy. 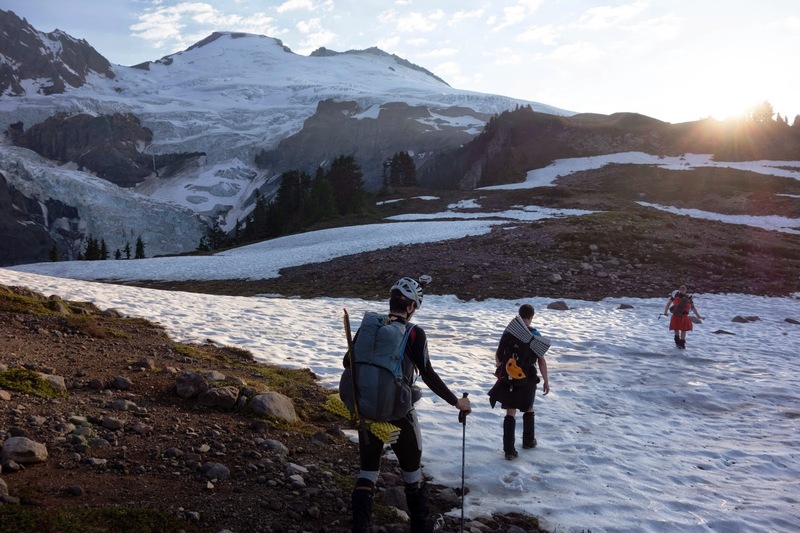 We returned to the trailhead just before 10 p.m., and everyone was fried — both by the sun, and the surprisingly huge effort of climbing Mount Baker. 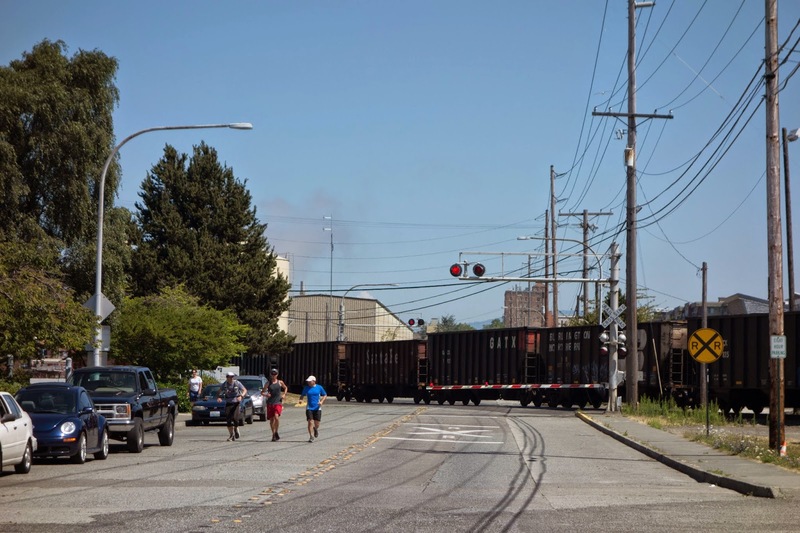 The boys still had 45 miles to run back to Bellingham and I wondered if it would really happen. They took a thirty minute nap and rallied to go, knowing they'd regret passing up the opportunity to complete a journey that has been in the making for over a hundred years. I was responsible for crewing them the rest of the way to the finish. They were kind enough to grant me a reprieve for the first half so I could drive back to Acme and catch a few hours of sleep (and hopefully be conscious enough to drive for two hours to the SeaTac airport the following afternoon.) Along the way I left little care packages of Gatorade, water, and cans of beer for the boys. 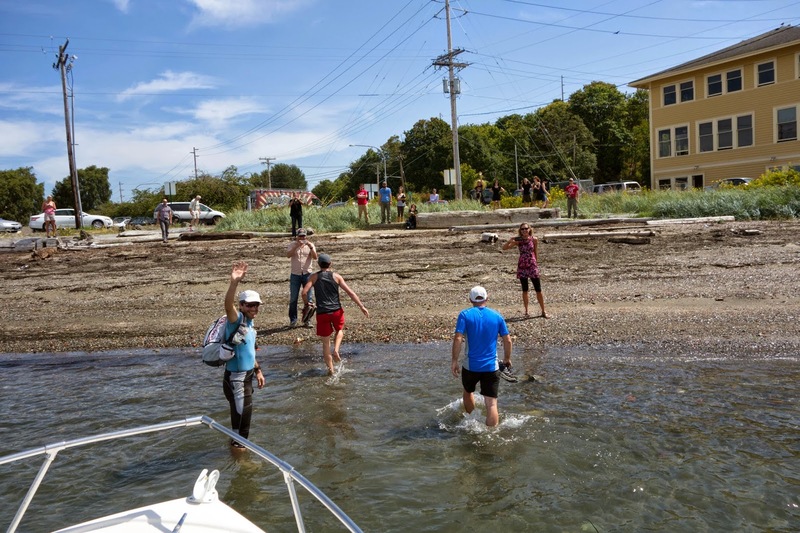 It was just before 1 p.m. by the time they returned to a few inches below sea level in Bellingham Bay, for an elapsed time of 48 hours and 17 minutes. They actually put in a negative split on the final 45 miles — despite the half-hour nap, they ran that section nearly an hour faster than the way out, when Daniel admits they spent a lot of time goofing off. 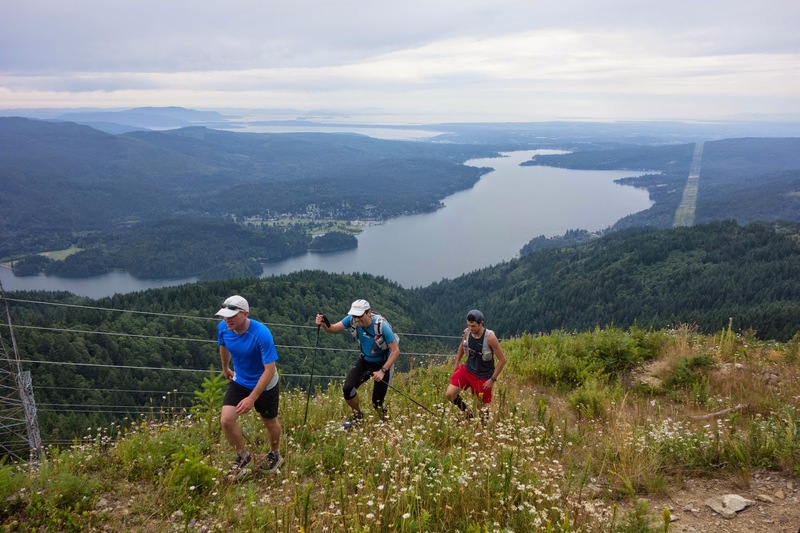 What really surprised me about this run is just how much effort a proper mountain climb really adds to a typical ultramarathon. 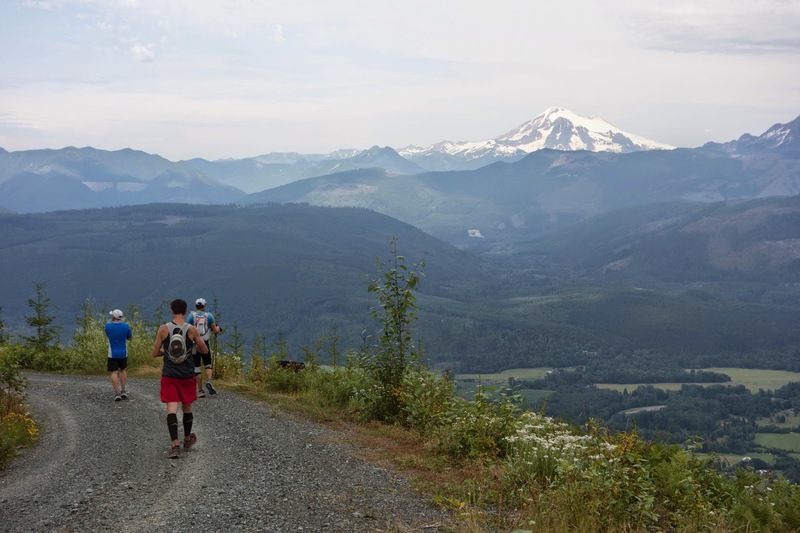 Daniel is interested in turning the Mount Baker Marathon into an official race, and it won't be easy to bridge the divide between running and climbing, not to mention organizing all of the necessary logistics. But I admire his ambition. He did a lot of work, and rallied a lot of helpful volunteers and supporters to make this run happen. I'm grateful that Beat could be a part of it, and that they let me tag along. That's so awesome! 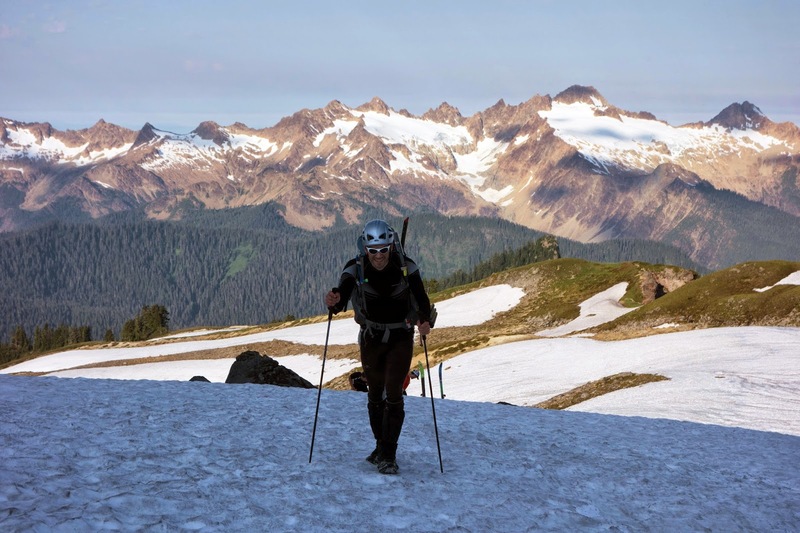 I've done a few different legs of Ski to Sea (the adventure race that is "inspired by" the original Mount Baker marathon), and I can't even imagine the effort of doing this. This is so great! Way to go guys!